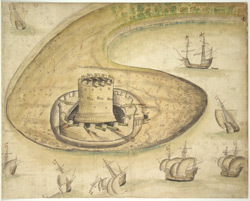 This is a drawing of Calshot Castle near Weymouth, Dorset, dating from 1539. It has been titled in a later hand ‘For the Wiche’ suggesting that the fort was intended for Weke or Wyke near Weymouth. However, the view of the area suggests, when compared to known views of Calshot, that it is in fact depicting Calshot Island or spit. Calshot was one of many fortifications built along the south coast after Francis I of France and Charles V, Holy Roman Emperor and King of Spain signed a peace treaty in 1538, making an invasion of England likely. England and France were ancient enemies and the catholic Charles V, nephew of Catherine of Aragon, was angered by Henry VIII’s decision to divorce her. Calshot Castle stands at a point of significant strategic importance occupying the end of Calshot spit, dominating the entrance to Southampton water. Calshot and its contemporary fortifications were the first in England built to house cannons and resist cannon fire. As can be seen from this drawing the design was practical and the aim was to house as many cannons as possible. The three story gun tower reflects the limited elevation capability of early Tudor cannons, a problem overcome by mounting them at different heights to obtain a greater depth of fire. It is believed that some of the building stone for Calshot Castle came from Bulieu and Netley Abbeys following their dissolution. The well-observed drawings of ships perhaps betray the hand of Anthony Anthony, a talented court draughtsman.